When Eduardo Bolsonaro, son of the Brazilian president Jair Bolsonaro, said that “without Olavo, there would be no election of Jair Bolsonaro,” his remark shocked me, and I published the following article: Eduardo Bolsonaro says that “without Olavo, there would be no election of Jair Bolsonaro”. But someone else, much more important than I am in Brazil, also was shocked: The most prominent Brazilian televangelist. In a 18 March 2019 tweet, Rev. Silas Malafaia, a Pentecostal televangelist who is known throughout Brazil and other nations, said that Bolsonaro personally told him several times that if 80 percent of evangelicals supported him, he would be elected president. According to the Brazilian newspaper Folha de S. Paulo, Bolsonaro got at least 70 percent of the evangelical vote, and he was elected. Malafaia’s intervention on Twitter has dispelled the anti-evangelical FakeNews that Olavo de Carvalho, who has a background in Islamic occultism and astrology, was the man responsible for Bolsonaro’s election. WHAT PRESIDENT BOLSONARO TOLD SEVERAL TIMES: If 80% of evangelicals support me, I will be elected president. That is what happened. Now comes his son, an apprentice of politician, to say that Olavo de Carvalho is the one most responsible for his father’s victory. SIMPLY RIDICULOUS! Different from Carvalho, who has got more fame at the expense of Bolsonaro as president, Malafaia was already internationally famous much before Bolsonaro and Carvalho. In 2011, the New York Times interviewed Malafaia in a report headlined “Evangelical Leader Rises in Brazil’s Culture Wars.” So Malafaia’s international fame in the cultural wars against abortion and the gay agenda is not something new. And it is by his own merits. During the Brazilian presidential election, the New York Times showed the decisive role of Malafaia to elect Bolsonaro. For some reason, after the election Bolsonaro stopped valuing his evangelical supporters and began to glorify astrologer Olavo, who has lived as a self-exiled immigrant in the U.S. for 15 years, but he was never able to achieve fame by his own merits. Perhaps now, with Bolsonaro making free propaganda to him, he may achieve some fame. Besides, Steve Bannon, who had been expelled by Trump for leaking secret information, has promised to make Carvalho famous in the U.S. Bannon is now close to Bolsonaro, because of Carvalho and Eduardo. After being fired by Trump, Bannon created a movement to influence right-wingers in Europe and Latin America. Bannon chose Eduardo to represent his movement in Brazil and Latin America. Bannon, Carvalho and Eduardo are doing everything possible to expand Bannon’s Guenonian movement — at the expense of evangelicals who elected Bolsonaro. Their big problem is that the astrologer whom they credit for Bolsonaro’s victory does not have millions of followers. In contrast, evangelicals represent millions of voters in Brazil. The Facebook fanpage of astrologer Olavo has over 500,000 followers, virtually the same number of fans of Walter Mercado, a Puerto Rican astrologer who became famous on Brazilian TV in the 1990s. So to say that a Brazilian astrologer was responsible for the election of the Brazilian president is akin to say that a Puerto Rican astrologer was responsible for the election of the U.S. president. Only people under a powerful spell see reality reversely. Rasputin kept the Russian czar under such spell. This is the reason I call Carvalho Bolsonaro’s Rasputin. Others call him “guru of Bolsonaro.” Carvalho rejects and calls these names FakeNews. 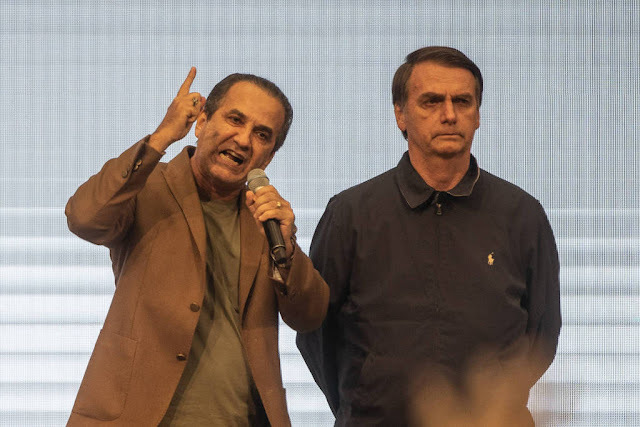 VOA, the largest U.S. international broadcaster, officially called Carvalho “Bolsonaro’s ideological guru.” VOA belongs the U.S. government and it broadcasts U.S. government views. So the most powerful broadcaster of the U.S. government broadcast to the whole world that Bolsonaro is dependent on a guru. Bolsonaro cannot complain that he was internationally portrayed by the U.S. government as dependent on a guru. His decision to have Bannon in an exclusive dinner at the Brazilian Embassy on the eve of his meeting with Trump was a slap in the face of Trump. And to say that an astrologer, not millions of evangelicals, was the man responsible for Bolsonaro’s election was a slap in the face of evangelicals. Such opportunism is a perfect description of Carvalho and how he and his adherents are taking advantage of Brazilian evangelicals by “leaking false information to the media” (“without Olavo, there would be no election of Jair Bolsonaro”) to make themselves seem far more important than they are. Trump did very well by firing one Guenonian opportunist: Bannon. But Bolsonaro is sowing troubles to himself by making himself dependent on two Guenonian opportunists: Bannon and Carvalho.